America's most renowned spray tanning training center Hollywood Airbrush Tanning Academy has just announced the graduation of Danielle Currier, a former healthcare professional from Stillwater, Minnesota. Danielle just formed her own airbrush tanning business Dee's Spray Tan and is serving several cities across Minnesota and Wisconsin. Hollywood Airbrush Tanning Academy continues to maintain their remarkable track record in the beauty and wellness community of the country. New students continue to fly in from all over the country to train and learn the art and business of airbrush tanning. The top rated airbrush tanning education center has just announced that yet another student of the academy has opened her own airbrush tanning business after the completion of her hands on spray tanning training course. Danielle Currier, the latest graduate from the academy is now serving customers in Stillwater, Oak Park Heights, Woodbury, Bayport, Lakeland, Oakdale, and St. Paul in Minnesota through her new airbrush tanning business Dee's Spray Tan. Sunless tanning services from Danielle is also available in Houlton, Hudson, and Somerset Wisconsin. Airbrush or spray tanning is the sunless form of tanning that is rapidly emerging in terms of popularity all over the world. Many tanning enthusiasts are no longer interested in exposing their skin to the Sun's ultraviolet radiation. As a result of its increasing popularity, spray tanning has become a popular career choice. Many established professionals from other fields have now started their own airbrush tanning business. 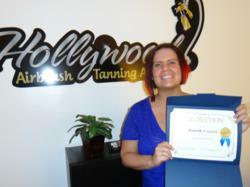 Hollywood Airbrush Tanning Academy was formed over two years ago by renowned spray tanning expert Simone Emmons. 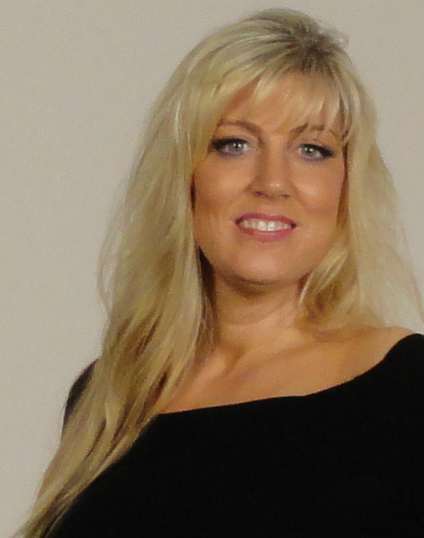 Simone has had an illustrious career as a professional airbrush tanning technician and business owner in Los Angeles and is now involved in passing on her knowledge and expertise to help other aspiring spray tanning professionals. Before starting her own business as a spray tanning specialist, Danielle has worked as a Health Unit Coordinator for eight years at Woodbury Health Care Center, Lakeview Hospital, and St. Joseph's Hospital. Talking about her decision to learn airbrush tanning, Danielle says, "I wanted to find something that could work with my school schedule, and I've always wanted to own a business. I really love socializing with people and helping them feel their best. This seemed like a perfect fit." She also mentions that her long term goal is to "give a positive light to airbrush tanning and help people stay away from tanning beds. I want to show everyone the joys of spray tanning and provide it at a reasonable cost." Dee's Spray Tan can be contacted at 651-785-5352 or at http://www.facebook.com/deesspraytan. Hollywood Airbrush Tanning Academy is located in Los Angeles, California and offers an extensive Airbrush Tanning Certification program to anyone who wishes to learn the art and business of spray tanning. Simone Emmons, the creator of the spray tanning training program has been a professional, licensed spray tanning technician and teacher and has helped numerous entrepreneurs from Utah, Colorado, Nevada, Minnesota, Arizona, South Carolina, Washington, Oregon, Florida, California and the Island of Hawaii and Trinidad start a business in Airbrush Tanning. The spray tan program is unique because it provides hands-on and private spray tanning training to individuals who want to start an Airbrush Tanning Business. According to Emmons, this spray tanning program gives individuals a leading edge in starting an Airbrush Tanning business immediately after finishing with the training. Students have the option to choose from a full day course of 10-12 hours or two half day courses of 5-6 hours a day or through live video conferencing. The academy is also launching a website soon so students can learn Airbrush Tanning Online. Many tanning training institutions only educate students on their own equipment and products they sell, however Hollywood Airbrush Tanning Academy does not sell any of their own products and provides training and education on all equipment and good products in the airbrush tanning industry.